These plaques are very different from the others we are offering. 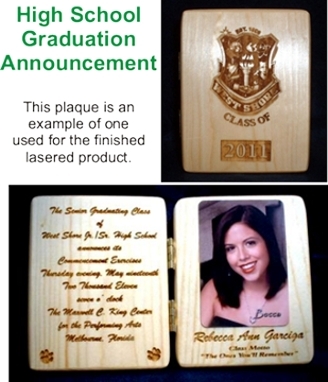 For the custom plaques we can copy your written invitation or announcement with a laser cut; the fonts may vary, so it may not be an exact duplication(just email me a scanned image of the actual document at minimum 300 dpi or mail me an original document at PO Box 1404 Cape Canaveral, Fl 32920). Either way I think you will be pleased with the results. All our plaques are made of recycled white pine, edges eased, sanded smooth, and finished with at least 2 clear finish coats. Image Logos are laser etched and all information is to your specifications. All plaques have solid brass hinges. This plaque below is an example of the one used for the finished lasered product. We did this for a high school graduation announcement. The plaque below is a wedding invitation. Go to "Newborn Baby Plaque Page"
Go to "Realtor Wooden Plaque Page"
Go to "Military Wooden Plaque Page"